Enhanced formulation for repairing DNA. Combines a number of antioxidants that protect against oxidative stress. Achieving or maintaining optimal health depends first and foremost on good cellular health. The main focus of current scientific research into extending life expectancy is almost certainly the protection and repair of damaged DNA. DNA Repair is a completely new formula that both protects - and increases our ability to repair - DNA, the carrier of genetic information. Our cells multiply every day but the fragile DNA within each cell is vulnerable to damage by a range of factors including free radical attack and lack of vitamins, minerals and enzymes ... When DNA is damaged, cell function becomes impaired, potentially to the point where cells are unable to self-replicate and divide. Current scientific thinking supports the theory that it is the gradual destruction of DNA which leads first to accelerated ageing and then to overall impairment of the body, with a decline in capacity for self-repair that becomes increasingly ineffective with age. Self-replication of cells thus takes place in a damaged or corrupted form and cell division subsequently ceases to occur. This degenerative process can, however, be impeded with selective use of nutritional supplements. 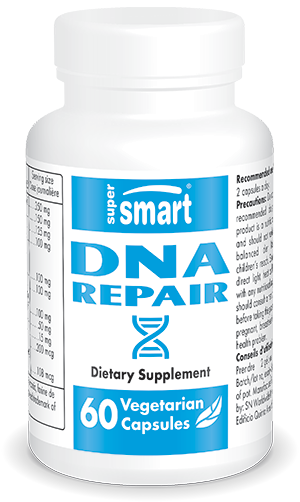 DNA Repair contains specific plant extracts, vitamins, minerals and antioxidants that act synergistically to support DNA repair processes. - improves inflammatory response by normalising NF-kB which is a nuclear transcription factor governing the genetic code of a number of proteins that regulate cell apoptosis and the mechanisms linked to inflammation and cell growth. • AC-11®, standardised in CAE, is thus without doubt one of the most active anti-ageing agents, complemented by other antioxidant and reparative substances. The broccoli extractin DNA Repair is standardised to 10% sulforaphane. This widely-studied glucosinolate is an enzyme activator. Comparable to I3C (indole-3-carbinol), it is able to neutralise carcinogens by activating so-called phase 2 liver detoxification enzymes. It can also protect against certain chemically-induced cancers such as colon and prostate cancer. It is a major protector of cell integrity. Boosting its action, is an extract of wasabi or horseradish , added for its content in various glucosinolates which play a role in regulating liver enzymes, preserving DNA and improving the inflammatory response. Arabinogalactansextracted from larch (Larix occidentalis) impede inflammatory processes and are highly effective at supporting the immune system by increasing NK cells (hence their use in liver metastases) and lymphokines, thus combatting the destruction of cell DNA by various aggressors. SOD-Gliadins complex is the only stable, oral form of SOD (superoxide dismutase). This melon extract combined with a wheat protein (gliadin) protects DNA from oxidative damage. • combats inflammatory and oxidative processes, thus protecting DNA from attack at a cellular level. Chlorophyll, in the form of sodium copper salt, complements these other substances by combatting free radicals and by binding to certain toxic chemicals, thus aiding their elimination from the body. Last but not least, this product also contains vitamin B9 in its most bioavailable form (Quatrefolic®), vitamin B12 (methylcobalamine) and zinc pidolate - three essential catalysts that participate in redox and methylation of DNA. This complex can be taken for long periods, either on its own or combined with cycloastragenol which also stimulates DNA repair by activating telomerase, or even with pyrroloquinoline quinone (PQQ) which protects mitochondrial DNA. Quatrefolic®, Gnosis, Italy. GliSODin®, Isocell, France.